Imagine the zombie apocalypse we always refer to as a society has finally happened. You’re in your safe haven and the zombies are coming (you hear them slowly creeping up, dragging their limbs, ready to tear down your door and eat you up). Gruesome, I know, but just buy into this for a second. Now, you’re looking for your weapons. You were prepared, you did at least have the forethought to buy a gun and a dagger, you’ve got an axe and a pair of scissors. You know what tool you need for the job, but unfortunately, you can’t find it. You spend 20 minutes rifling through your big trunk of weapons, but it’s too late. The zombies have come crashing through your door and you have nothing to defend yourself with because you just can’t find what you were looking for. That’s how I feel when I think about an unorganized, yet intentional, bookshelf. You have the right idea to curate and find books that fit your family values and unique needs, but you don’t have it reliably organized to actually have the impact it could. Let’s back up for a minute – what the heck is an intentional bookshelf and who am I? Why hello, thanks for asking! My name is Sam, and I am the blogger and kid lit expert behind Addison Reads. I teach parents how to find the right children’s books for their home library that reflect their most important values and unique family to create what I call an Intentional Bookshelf. Instead of feeling parents as though they are responsible for teaching their children all of the amazing things they want to teach them completely on their own, I show parents how to unlock the value of children’s books to do the heavy lifting. Our children become what we read to them, so why not reiterate our most important values into the books they consume? You can learn more about the concept of The Intentional Bookshelf, here. Anywho, there’s a huge caveat to this amazing resource library specifically curated for your family. Its usefulness is lost as soon as you can’t find a book you need when times get desperate. It is like the Zombie Apocalypse analogy. Your kid (the zombie) comes home from school crying. They’ve been bullied. You’ve got a box filled with books and there’s definitely one related to bullying but you can’t seem to find it (the trunk with weapons). Unfortunately, because you can’t find the book, you lose your effectiveness and the opportunity to use this children’s book to help your child work through this, is lost (you get eaten by the zombie). It’s easier to find things – as described above, your ability to locate books when needed directly correlates to how valuable your home library can be to you as a parent. It looks nice - Who wants to spend hours finding and perfecting and tweaking a home library if no one ever gets to look at it? Trust me, it’s a thing of pride to have a friend come into your home and comment on how nice your bookshelf looks (I know that cannot be just me who appreciates those compliments). It’s a teaching opportunity – Your children pick up on absolutely everything you do. When they see you putting their books away in a certain place and in an organized way, they will pick up on that, too. Plus (as we’ll talk about below) the actual organization and sorting process can be a learning moment. It’s easier to see what you need more of…and what you don’t – One thing I am constantly reiterating to parents is that you don’t need 1,000,000 books to have an intentional bookshelf. You just need to have the right books. When these stories are organized and categorized in a way that showcases what value or topic they address, you can easily see where the holes are (if you only have 1 book in a really important topic for example) or where you have plenty of resources (if you have 60 books in a single topic, that might be a good sign you don’t need to add too many more of that kind right this second). There are several ways to organize your books, and no one way is preferable over another. What is most important is that you organize in a way that makes sense for you and your family, and increases your chances of finding a book when you need it – and fast. The “How” is broken into two sections: how to physically organize your books and the sorting method. Categorized Boxes: Similar to the pantry method of organizing your food and pantry items into boxes, you can do the same thing with books! When you are organizing your intentional bookshelf, the whole point is that you know what category, topic or value a book is addressing. Each book, therefore, would go into its designated box. That way, when there is a dire need for a book in a particular topic, you can simply grab that box and choose the right book to fit the job. Here’s a concrete example. Some of our most important topics right now are: silliness, separation anxiety, hitting, potty training and female empowerment. I would have one box for each topic and put our books into the corresponding box. When it’s time for potty training, we grab that box and work through the books. When it’s Sunday night and our daughter is feeling nervous about going off to school, we get a book from the “separation anxiety” box. Our weapon trunk is now split into 5 smaller weapon trunks for each need. Front Facing Wall Shelves: This organization method certainly addresses the “wanting to look nice” part. Front facing wall shelves essentially involve placing the books on low shelves (within reach of your child) where the covers are exposed instead of the spines as they would on a traditional bookshelf. The value is two-fold. 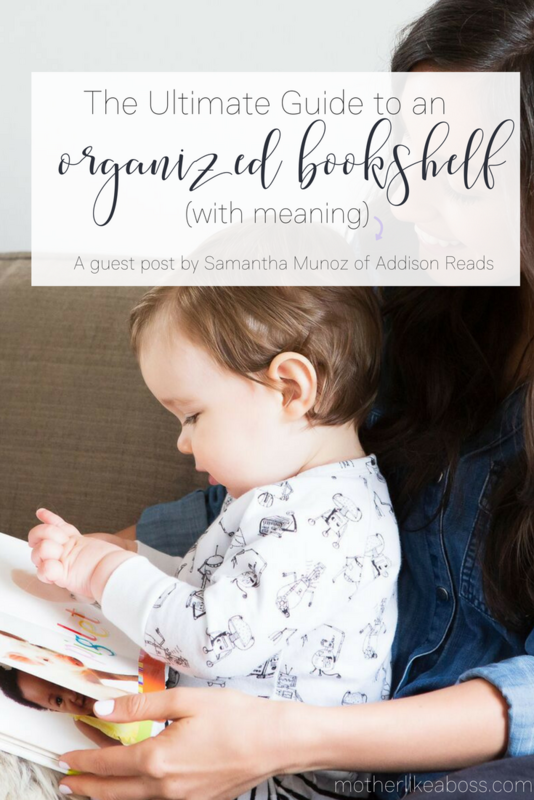 This type of organizing makes for instant wall décor and your children are much more likely to grab a book when they can see the pretty cover. Travel Bags: If you’re out and about often, it’s a good idea to keep an organized set of books in the car to keep your children occupied (with something other than a tablet or phone the whole ride). Travel bags or bins in the car keep your books organized instead of sliding under the car seat – which is totally as unsafe as it is annoying. Bookshelves: You really cannot go wrong with a traditional bookshelf. There are so many unique ones to choose from, too. Tall ones with ladders, short ones with low shelves for your kids, even round ones – we are ordering this awesome round one from world market that’s totally unique and very “us”. Keeping Books in Different Rooms: Similar to the idea of categorized book bins, keeping books in designated rooms is a great way to organize them for quick access. Recalling the example of the potty training books, you can keep the books in a cabinet in the bathroom to ease the process as it happens (that way you don’t have to run to another room to grab it, leaving a undie-less toddler in the bathroom alone…dangerous!). Sorting the books themselves in their physical state can be accomplished in so many ways and again it’s important to know what works best for your needs. It might even change over time and be dependent on the ages and life stages of your children and family. Alphabetically: The most pragmatic way of organizing is alphabetically (either by author or by book title). Most libraries and bookstores are sorted in this fashion so this method would be useful to get your children familiar with that type of set up. This method also has the benefit of doubling as a teaching opportunity – practicing the alphabet, letter recognition and letter order. By Topic: This sorting method directly correlates with the “categorized boxes” physical organization style mentioned above, but could be implemented in any type of physical structure. In my opinion, organizing by topic is probably the best way to ensure you know what books you need and have at the ready for a particular situation. These might be rotated in terms of accessibility depending on what life stages and situations your family is dealing with at the present moment. By Color: Similar to the alphabetical method of sorting, this can double as a teaching opportunity, helping your child distinguish between different colors and practice the order of the rainbow. I would argue this is the most beautiful sorting method (seriously, there are so many beautiful rainbow-sorted bookshelves that make me totally swoon). By Child: Similar to sorting by topic, sorting by child can help you quickly find a book when you need it for a particular situation. If your youngest child is being bullied, these might be “his books” whereas your oldest might be dealing with female empowerment, so those books might be “hers”. They can all still reside on the same organized bookshelf, but sorted in such a way that it is easy to identify whose books are whose. These sorting and organizing methods are great on their own, but any combination of them could work well for your family. The important part is identifying what you need your bookshelf to do for you and how you can best accomplish that through organization. My greatest hope for you is that when the zombies come, when your children need you most, that you can be prepared with a book at the ready and know exactly where to grab it off your shelf. Are you ready to maximize the value and power of your bookshelf – but you have about 1,000 children’s books to sort? Join the #ReclaimYourBookshelf challenge to get rid of the books that don’t serve your Intentional Bookshelf before you take on the task of organizing them. The ability to find the right book, when you need it! We’re starting live September 12 - say goodbye to children’s books you don’t need and HELLO to an intentional bookshelf that’s ready to grow. Click here to join! Samantha Munoz is a mother, wife, engineer, bibliophile and avid coffee drinker. She is also the expert kid's lit curator at Addison Reads and author of The Intentional Bookshelf. Sam helps parents as they search for the perfect books for their little ones and helps moms and dads build a library with a purpose. Once a seriously overwhelmed and stressed out parent herself, Sam turns to children's literature for the answers to all of her parenting dilemmas. She loves when it rains because it gives her an excuse to stay inside and read with her daughter! Follow Sam around the web!